homework, his lunch money, any dead jellyﬁsh she could ﬁnd on the beach, countless plastic bags that once held food, and my HRT (estrogen) prescription–pills, bottle, and packaging–which the postman once threw over our fence. When I ﬁrst took up basketry last year, she tasted, mangled, but then wisely rejected, a prickly pine needle basket I was working on. But it was a dry, ﬁnished kelp basket that led to her demise. When Choco stopped eating last month–a clear sign of serious illness in a Labrador—sonograms identiﬁed a large organic substance in her intestines. After a three-plus hour surgery, the vet showed me the blob he had removed to see if I could identify it; some of the sewn panels of the kelp basket were still intact. Poor, sweet Choco died a day later from a stroke. 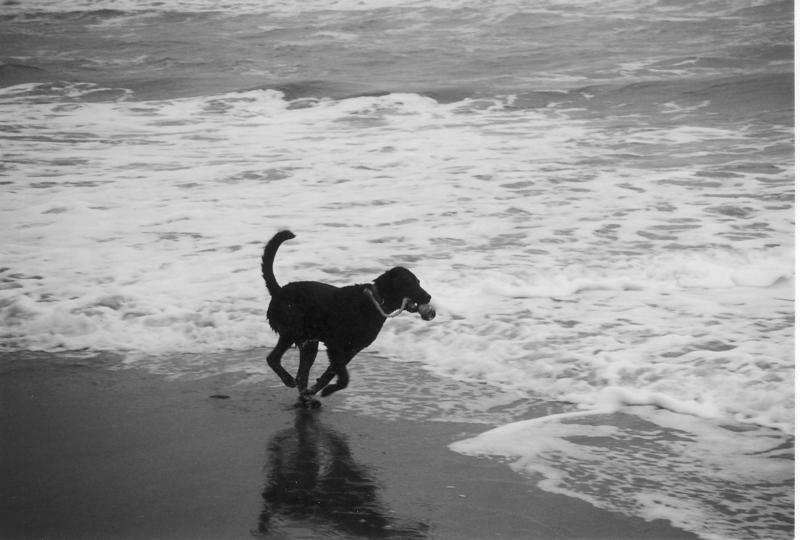 If there is a dog heaven, Choco is romping in the ocean waves right now, swinging her kong over her shoulder, and then gamboling through the sand to roll in a dead seal. Hopefully, she will pass on the kelp this time. She will be missed.